Happy Monday. Hope you are starting a productive week and find lots of things to be grateful for! Stormy nights. And safety. We had a strong line of storms come through the east coast over the weekend, bringing high winds and even tornadoes in many areas. My little mountain town was under a tornado watch until the wee hours of the morning. Thankfully, there was no major damage in my area, but I did get the benefit of falling asleep to nature's lullaby - the thunderstorm. Weekends with my sister. I got to spend the whole weekend with my sister and her family. We were cleaning and preparing for the big Easter gathering our family has. Even the kids chipped in. (My nephew LOVES the Swiffer and claimed responsibility for cleaning all the hardwood floors.) A lot of work was done, but we also had a lot of laughs. Hot/cold showers. I am normally a cold shower girl. It's better for my skin and my hair, plus it's a great wake-me-up tactic. That being said, there is something about letting the hot water soothe aches and pains, and it always seems to be emotionally cleansing too. I was recently chatting with a friend who is traveling overseas in some very rural (not-quite-third-world, but close) areas, and he was saying that he was lucky if he was able to get a shower, let alone a hot one. He has been lugging buckets of water from the local well for bathing and other uses. Hearing this definitely made me grateful for running water and the ability to choose my preferred temperature. Baking cookies. We all know the kitchen is one of my favorite places. Cooking/baking allows my hands to stay busy and gives me time to process my thoughts. This weekend, chocolate chip cookies were on the agenda, and it was like a mini session with a counselor. I will never trade my love for the kitchen. Quiet time and a stack of books. The little book counter on Goodreads has been my nemesis lately, telling me how many books behind I am in my reading challenge. 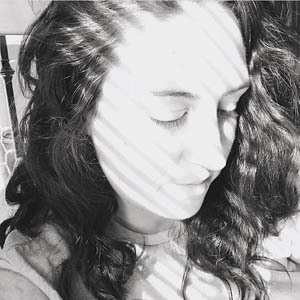 I cleared out some time in my schedule and made a point to sit down with a few of the books I needed to finish. I managed to work through five books in one weekend. Yay for intentional quiet time. 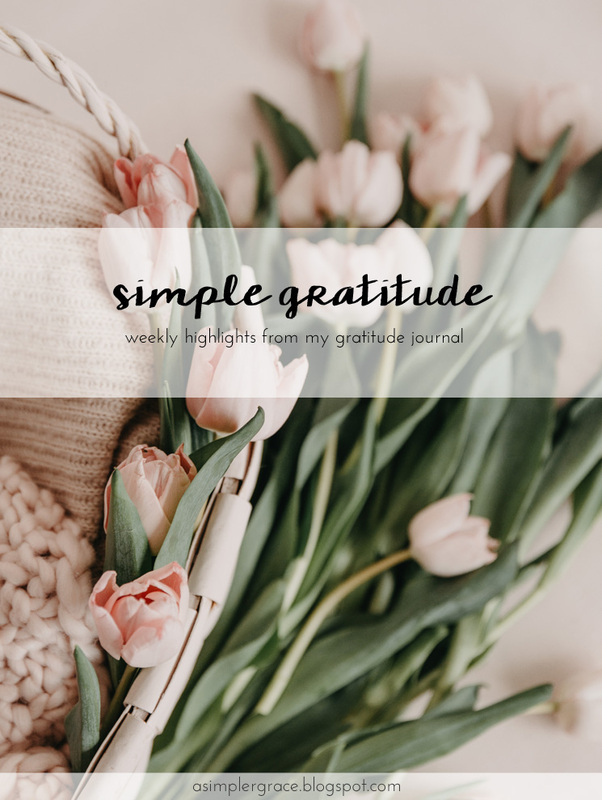 The post Simple Gratitude | 145 first appeared on A Simpler Grace. If you enjoyed this article, please feel free to share it with your friends! Don't forget to join the ASG Tribe! I need to sit down with my books too, Goodreads is also telling me I'm behind on my challenge - yikes! I'm glad that the storms weren't too bad for you. Falling asleep to thunderstorms is my favorite. I live for quiet time, even though I am home alone all day! It really is the best though. Not that I don't love spending time with my guys too LOL . Cookies are on my to do list this week. And my sister spend the weekend with me :) . Gotta love sister time! The shower one is a good reminder that most of the things we take for granted are considered luxuries in other parts of the word. Thanks for sharing these beautiful thoughts! Five books in one weekend?! Look at you go! Honestly, a week of thunderstorms (minus the alarm of a tornado warning), fresh-baked chocolate chip cookies, and a stack of good books sounds like utter perfection. I hope the week ahead has more wonderful things in store for you! I love the photo in this post! It is so calming and beautiful. I've been grateful for all the things you've listed. We had a wonderful thunderstorm last night, and I'm always grateful that a tree didn't fall on the house. I love having trees, but it is also a bit scary at times. A few years back we cut down a HUGE maple tree (over 100 years old) that had branches overhanging our bedroom. It caused me a lot of angst to cut it down, but every time we have a storm, I am so glad that we did. There is another one pretty close to the house, but not directly over our bed. It just gives me the occasional worry, so it seems like we should keep it. Thanks for coming by to read, Sabrina! Yes, we have oak and poplar trees that are over 200 feet tall and they are all over the property and around the house. It can definitely be scary in those high wind storms!